The Flyline Modular Digital under and over voltage protector, is an advanced device with German Technology .FDP is protecting all home appliances, laboratory equipments etc..From voltage variations .voltage fl in power supply will cause damage to our costly home appliances .FDP is protecting appliances from voltage variations .We can set high voltage cut off and low voltage cut off and time delay can be set. All these functions .User can set and self healing .the electrical protecting devices available in the market has defects like no auto setting, the system will not work if earthing is not proper and once it is off we have to put it on manually.FDP is switching OFF and switch ON automatically. Even if you are not in the house the FDP taking care of all appliances,CCTV Security alarm system etc..FDP is an ideal equipment for locked houses of NRI’s.FDP can be fixed in main distribution board easily . The Protector will act if the following occurs. 3. Breakage of neutral line. 4. Breakage of any live line. 5. 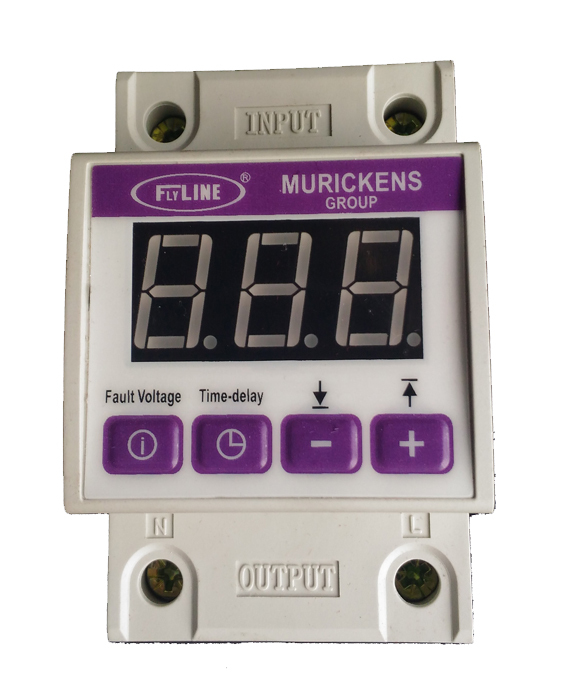 Under-voltage Cut-off Value : AC180±5V,0.1 seconds’ action delay. Recovered Value : AC195±5V. (120-210V adjustable). 6. Time Delay: Start time for First Connection: 15 Second. Delay time is free to set from 5 to 600 seconds after the first time. 7. Rapid action: The power disconnects the appliances with in 1 sec. 8. Self Power Consumption : ≤ 3W. 1.This button : for displaying the voltage (3 phase or 1 phase )Press the button for 10s to switch to single phase voltage indicating. ►Sequence disorder.►Phase unbalance.►Breakage of neutral line.►Breakage of any live line.►Over-voltage of any phase.►Under-Voltage of any phase. 4.Over Or Under Voltage Protection :H and L on the left ,center and rigt of the indicating board stand for over voltage and under voltage of phase A ,B and C respectively.